Interesting session last night. I rarely react to the political scene. Last night I finally did; liking this, liking that, liking the other things. Most of the likes were in controversial areas. Now this morning they are gone without a trace. I can’t help but think that social media reactions are monitored by the hyper-government to keep business as usual. The old me would have built a pithy argument about how “dumb” FB is and write a post-ultimatum farewell address, threatening never to be seen again. Now my thinking is that I could get a head start by ignoring FB and moving on. I have been claiming to be a writer for years without publishing anything. God is so big, so capable that he allows each of us to create our own universe to behold. Because our friends and family affect our actions, they share a lot of our created space. This landing page is designed to keep traffic from wandering very far into the blog. As I mention to people that I direct to Softwarehank.com, this is a personal site. I tell everyone that they will probably land on something that does not relate to why they came [here]. Today I gathered together drafting supplies that have accumulated over the years, most of them many years ago. 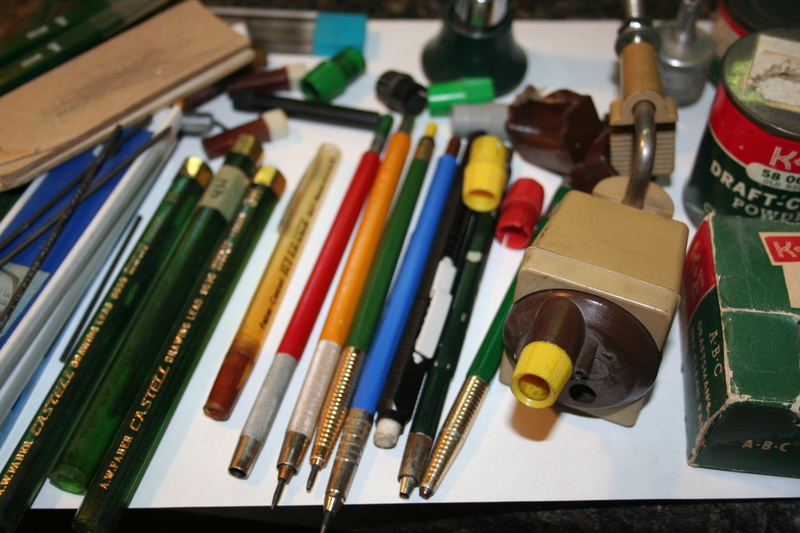 Several lead holders (one once belonged to my supervisor), paper cleaning powder and pad, long leads of different hardness, compasses and dividers (most missing parts) and a variety of sharpeners are all going to the landfill. All this equipment is obsolete. I have moved them around over 40 years, putting value on them based on the symbolic representation of work performed. I wanted to save a few things while filling a garbage bag. but they’re all gone now. I have coasted along this first year of retirement, content with TV re-runs and doing whatever pleases me. With all the violence and dirty politics in our lives today, I am guilty of watching a train wreck without any effort on my part to make anything better. Months ago I stopped reading a book because it came very close to an explanation of how/why our society has become so disordered. I stopped reading it because it started to make me feel reactionary. All I could see was a lot of work. I picked the book back up this morning, re-reading chapter 7 and 8 again.